The Oven! The Oven! The Oven Was On Fire! So every year around New Years, I either hang out at home catching up on movies, or I end up going somewhere. This year, Kelly suggested that we have some friends over for dinner and a bit of drunken Wii action, proving once and for all that the people who break Wii Straps are idiots. The menu we set was a beautiful beef roast with huge yorkshire puddings and finished with a red wine jus. 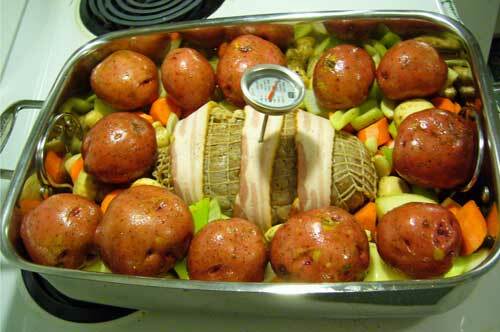 I surrounded the roast with potatoes and a trinity of vegetables as well as fresh mushrooms. They were lightly seasoned with sea salt, olive oil, and fresh ground pepper. The roast itself was stuffed with a bit of garlic, seasoned the same, and then seared on all sides. Maple smoked bacon of the super fat variety was laid over top to give the meet a bit more flavour and some extra moisture. I set the oven for 350 and cooked it for about 2:15 till medium well. The meet was allowed to rest for 30 minutes under tin foil while I prepared the Yorkshire puddings. Unfortunately, we were out of milk, so thinking quickly, I reached for the Soy Substitute. The Yorkshires came out not bad, but due to the thickness of the soy milk, the puddings just weren’t as crispy or as big as normal. However, most of the guests gladly drowned them in the gravy and enjoyed them all the same. The beef was very tender and very flavourful. It was a hit. Before and after the meal, we enjoyed a lot of wine and a a lot of beer. So naturally, we decided to play Nintendo Wii. I have to say, it was very cool to see a bunch of adults make fools of themselves while having a great time playing Wii Sports. Even tipsy, we broke no Wii Strap, proving once and for all that strap breakers are Wii-Tards. After waking up around 2 or 3 o’clock, we started cleaning up the place. The house was in pretty good shape, but the oven had a little bit of grease at the bottom. Kelly and I went out to grab some cleaning supplies and do a bit of shopping. When we got home at around 6 or so, we continued to finish cleaning and caught a bit of TV as a reward. 10:00 o’clock comes along and I start the cleaning process on the oven. I bought some Easy Off oven cleaner while we were out, however, it didn’t get used this time because we decided that we were going to be lazy and see if we can get away with using the Self-Cleaning function. Now, I’ve never used this function before, and I’ve never used it on this particular oven. I’ve always been the “Scrubbing” type. This oven had a couple quirks. 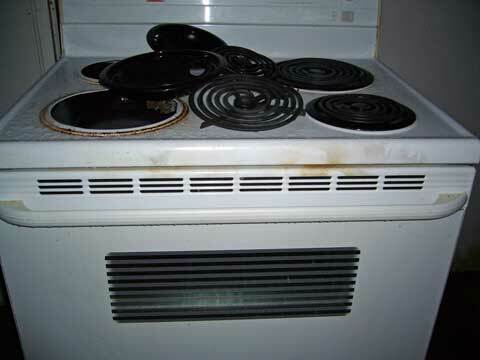 Using two elements produced uneven cooking temps on the large burners, and the pilot light for the rear small burner was always on, even though the burner was off. But it had never given us problems other than that. I turn the oven to the Self Clean selection. The oven door locks tight with a click. Apparently, the self cleaning function works by incinerating anything inside the oven into fine ash. Cool. So I hit the self clean timer button, and the countdown began at 2:30. About an hour later, the fire alarm downstairs goes off. Normally, I’m not too worried because our fire alarm tends to go off every once in a while as it is placed fairly close to the kitchen, however, this time, something smelt really wrong. As I rounded the corner to head downstairs, I saw thick black smoke clouds starting to develop. The smoke was irritating to my eyes, and as I got into the kitchen, there was a huge plume of black smoke coming out of the chimney of the oven! I immediately shut off the oven and grabbed the fire extinguisher. Smoke continued to pour of of the chimney and now the vents front vents. My eyes hurt from the fumes. I try to open the door so I could give it a hit with the fire extinguisher, but it wouldn’t open. The self cleaning function still had it locked down. I pulled out the storage bin, rolled under and pulled the main power plug. I got up, gave the door a hard yank and flames shout out of the oven from the sides of the door, the vents, and the chimney under the far burner. Not good. Then it would start to puke flames on its own. We decided to call the fire department because this was obviously out of our league. The oven was burning and flaming ever so often now, and the house continued to fill with smoke. The fire truck got here about 10 minutes later as we waited outside in the rain under the instruction of the 911 operator. The fire fighters went in and did their thing. After a few minutes, they ended up carrying the oven out of the house and into my front yard. The thing was still red hot. Luckily, there was no need to bring out the big hoses as that would have royally sucked with all the stuff we have stored in our basement under the kitchen. Apparently, this doesn’t happen very often according to the fire supervisor. Self cleaning ovens shouldn’t burst into flames. You can see the discoloration from the flames. Some of the black had washed off due to the rain outside, but there is still quite a bit of discoloration on the plastic bits. 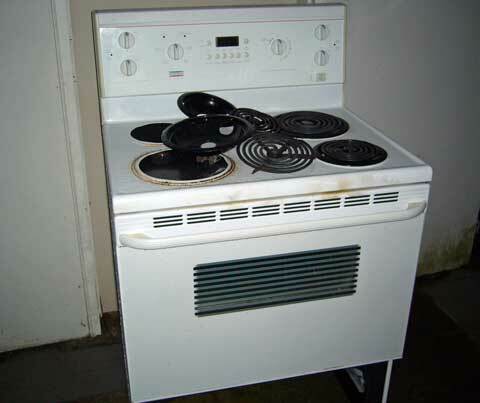 Luckily, the damage was pretty much isolated to the oven itself. It’s funny, but the door still won’t open. I guess it got so hot, the mechanism fused. Except for a very blackened range hood, the house was OK. It just smelled really bad from the smoke. The night of the fire, we had to sleep at Kelly’s parents place because our eyes stung so badly from the smell. It seems a lot better today. We’ve had all the windows open for a couple days now and all the air purifiers going full blast. I had to wash all my clothes over again, but I’d rather do that than find a new place to live. I could only imagine what would have happened if I turned on the self cleaning function and went out. I’d have nothing to return to now. The next day, I went out and picked up a new oven with a flat ceramic cooking surface, adjustable burner sizes, and a touch screen LCD display. It’s sweet! When the salesperson asked if I wanted the self cleaning version for an extra $100 bucks, I told him that the last oven I had with self cleaning cost me way more than $100 bucks. In fact, it’s the reason that I’m buying a new oven right now. As I was thumbing through the manual for the oven while he was ringing it through, it had a warning about leaving pets and especially birds out while the self cleaning function was on. Apparently, the fumes generated during self cleaning can kill them. Now I’m really glad I didn’t get the self clean option. Self Manual Scrubbing for me from now on! So that was my New Year’s excitement. I got fireworks and firefighters! Do you guys have any New Years stories to share?